The elementary academic program purposefully integrates science, geography, geometry, history, cultural studies and the arts while expanding skills in language arts, literacy, writing and math. This integrated curriculum presents information and concepts in a way that is meaningful and connected for the students. Like the primary program, each student is given individualized and/or small group instruction that addresses her specific needs, style and pace of learning. At any time of the day, children can be observed creating time lines, recording science experiments, researching topics of personal interest, writing an essay or creative story, manipulating grammar materials or solving mathematical problems. 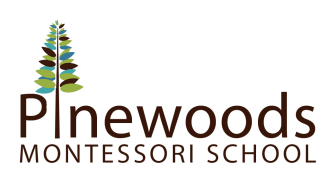 Pinewoods elementary classroom is a multi-age class with a Lower Elementary group of first, second and third graders. Based on a sound, well-proven knowledge of child development, this inclusive classroom is responsive to a diversity of learners. As a result, students develop curiosity and become confident, motivated, critical thinkers. The classroom develops into a community that works and learns together in harmony, develops social awareness, responsibility, and active participation in the school and broader community. Imagine a school where education is hands-on, multi-age and takes place in a cooperative community of learners. It's here!